We first introduced this service back in 1998, and ever since, homeowners have come to rely on it to keep their drainage systems operating at peak efficiency. Our professional Video Diagnostic Inspections are a tool that allows Perimeter Drainage to properly assess the problem with a drainage or sewer system. It is used to locate blockages, determine the condition of a pipe, check for sags in a pipe or properly map out locations of pipes and connections. The advantage of using a camera is that it allows us to quickly determine what the best course of action. The video diagnostic on your stormwater drainage system is performed by pushing a camera through your roof rainwater leader or installed cleanup. You can also access your drainage thru your drainage sump. To inspect your sanitary system, you would enter the piping thru an inline cleanout, a removed toilet, or an open pipe. If we find a problem, our built in transmitter and hand held locator can determine its location and proper repair method. If there is a sewer backup, assessing the cause, and location of the blockage can determine the best method of repairing the pipe. For example, if there is a break in the pipe then repairing the pipe would be a better method then inserting an auger and trying to clear the blockage. If there are roots in the line, inserting a root cutter would be the best option for repairing the problem. After the repair is complete, the camera can show the customer that the pipe is clear. Using a camera allows us to determine the overall condition of the drainage system. A map of the system can be properly created with directions of flow, locations of sumps, depths of pipe and locations of storm connections. This will allow the customers to visually see how their drainage system works. 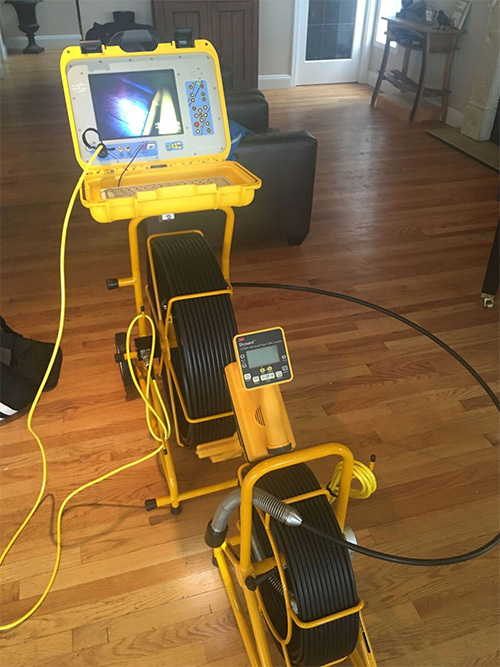 With over twenty years of experience with video diagnostic equipment on residential and commercial properties, Perimeter Drainage will accurately assess the problem with a drainage or sewer system ranging from 3” to 6” diameter pipes. Call us today to set up a preventative maintenance inspection on your sewer or drainage system.